The Urban Students in Arts Outreach Program, which provides instruction in violin, viola and cello, was developed by the String Academy of Wisconsin to help meet the needs of musically talented low-income and minority students who are deserving of professional instruction. The program creates a positive educational experience for disadvantaged students, and helps develop discipline, self-confidence, self-esteem, aesthetic awareness and cultural appreciation in students whose lives can be altered with serious music study. The mission of the String Academy of Wisconsin is to train string players between the ages of 4 and 18 to reach their fullest musical and personal potential, and to make this training available to talented, hard-working children regardless of their financial circumstances. The purpose of the USAO program is to seek out, enroll, and retain at-risk children from Milwaukee’s central city area and to integrate them into the professional environment of the String Academy. 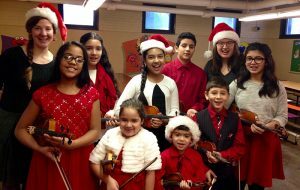 Since the String Academy’s inception in 1990, the USAS program has funded approximately 20 to 40 students annually. Outreach programs in two inner city elementary schools (Escuela Vieau K-8, and Cass Street School bring music training directly to the children. Music study is a valuable and expensive part of a child’s education. Violin or cello instruction is best accomplished through a one-to-one relationship between the student and the teacher over a period of many years. Students need music, concert tickets, quality instruments and instrument repairs, and the opportunity to attend summer music camps and other enrichment activities. For a student taking part in weekly private lessons, master classes, theory and ear training classes, and chamber orchestra for two seventeen-week semesters, plus summer study in a music camp, the cost can be $7,500 per year. The cost of operating the USAO program is over $75,000 a year. This includes the costs of instruction, instrumental purchases, rental and maintenance, attending concerts, purchasing of music, administration costs and transportation expenses. The USAO program receives support from the Milwaukee Arts Board, the Wisconsin Arts Board, a wide variety of foundations and corporations, and from hundreds of generous individuals.